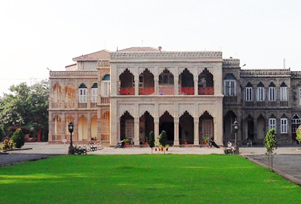 Build in mid 19th century by a German architect Simsom for Sir Takhat Singh; the Nilambagh Palace initially belonged to Gohils whose old family title of Rawal or Raol can be traced back to their historic battle with Alauddin Khilji in Chitor. Currently, this elegant structure is now converted into a heritage hotel. The modern Nilambagh Palace has a distinctly European aesthetic complete with well-stocked library and is spaciously laid out, exuding an old world charm. The rooms in the hotel feature furniture that reminds one of the olden times and fully equipped with modern amenities.